Lemuel was born on August 27, 1974. He is a self-taught airbrush artist designer as well as a painter who specializes in oil and acrylic on canvas. 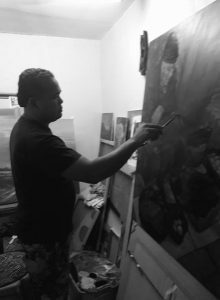 His style focuses on classical realism with elements of fantasy and cultural influences from the Philippines as seen in his works. He is an avid participant of art contests in the country and has won a couple of them. In addition to that, he is a member of the ARTipolo Group.